This page contains an extremely simple but (hopefully!) informative introduction to Lagrangian mechanics. I've labeled them with their common names: the second and third laws. The "first law", which I didn't show, can be derived from the other two laws, if we assume all forces arise from interactions between objects. The "Second law" as shown here assumes the mass of a body is constant (unless it ejects a second body or merges with a second body); that's true for Newtonian mechanics but not in relativity theory. From these two (or three) laws one can derive conservation of energy, momentum, and angular momentum. where φ is the potential function. The "Lagrangian formulation" of Newtonian mechanics is based on equation (1c), which, again, is just an alternate form of Newton's laws which is applicable in cases where the forces are conservative. Lagrangian mechanics adds no new "semantics" -- it's just a mathematical change, not a change in the physics. ... Newtonian mechanics has a problem: It works very nicely in Cartesian coordinates, but it's difficult to switch to a different coordinate system. Something as simple as changing to polar coordinates is cumbersome; finding the equations of motion of a particle acting under a "central force" in polar coordinates is tedious. The Lagrangian formulation, in contrast, is independent of the coordinates, and the equations of motion for a non-Cartesian coordinate system can typically be found immediately using it. That's (most of) the point in "Lagrangian mechanics". Before we go on I should hasten to add that the Lagrangian formulation also generalizes very nicely to handle situations which are outside the realm of basic Newtonian mechanics, including electromagnetism and relativity. But at the moment we're primarily concerned with the coordinate-independent feature. where T is kinetic energy, (1/2)mv2, and V is potential energy, which we wrote as φ in equations (1b) and (1c). For example, for gravity considered in a small region, we might use V=mgh. For gravity considered over a larger volume, we might use V=-Gm1m2/r. And so, for Cartesian coordinates, using equation (4) for our Lagrangian, equation (3) is equivalent to Newton's second law. To obey the second law, a particle must travel a path which minimizes the "action"; if we can find that path, then we'll know what the particle is going to do. The nice thing is that the path of least action is the same, no matter what coordinates you use. It's just the integral over time of a scalar -- that won't change, no matter how you choose to measure distances in space. So, to find the equations of motion in an arbitrary coordinate system K, we just need to figure out what the kinetic and potential energy must be expressed in the K coordinates. Then we write equation (4), take the derivatives used in equation (3) -- still in K coordinates -- and we'll obtain the equations of motion. Friction is not conservative, and so it doesn't fit neatly into the scheme we've outlined so far. 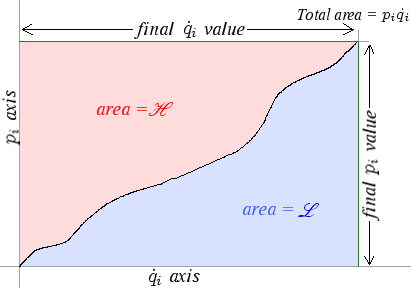 Certain non-conservative forces, including some cases of "constant friction" (which doesn't depend on velocity), can be integrated to obtain a "psuedo-potential" function, often called a "generalized potential", which can then be added to V in the Lagrangian formulation already given. But it's sometimes difficult to do that. In particular, velocity-dependent friction is difficult to model that way. where Qi is the non-conservative force (which is most often friction). Keep in mind that the frictional force, as I just wrote it, is coordinate dependent. If you change coordinates, you need to recompute it; there's nothing "automatic" about it. Note equation (11b). That's the angular momentum, and if we combine (11a) and (3), we see that its time derivative is zero -- so, it must be conserved. Conservation of angular momentum (for this case!) just fell out of the analysis "for free". It's common to define the Lagrangian for a particular situation as being the function whose path integral must be minimized to get the right equations of motion. This is useful, again, because it makes it so easy to switch to an arbitrary coordinate system, where the problem may be simpler the but the equations of motion would otherwise be difficult to find. where A is the vector magnetic potential; . Minimizing the action then produces the right motion according to the Lorentz force law, f = q(E+vxB). Note that in this case the "potential" actually depends on the velocity as well as the position, so it's not really a Newtonian "potential" function at all! But that doesn't matter; what matters is that, in Cartesian coordinates, the least action principle works with this Lagrangian function. Since it's a scalar, once we know that, we also know that we can use the same approach to attack the problem using any coordinate system. The path of least action then becomes a worldline which follows a geodesic. Equation (3) is a second order differential equation. The Hamiltonian formulation, which is a simple transform of the Lagrangian formulation, reduces it to a system of first order equations, which can be easier to solve. It's heavily used in quantum mechanics. The Hamiltonian is the "Legendre transform" of the Lagrangian, but we could just as well say the Lagrangian is (part of) what we get when we integrate the Hamiltonian by parts -- or we could say we just use the product rule (the "Leibnitz rule") to transform between them. Suppose we have a function u(v), where u is monotonic increasing. Then it's invertible; in that case we can talk sensibly about the function v(u). See figure 1. We've shown a curve representing either u(v) or v(u). 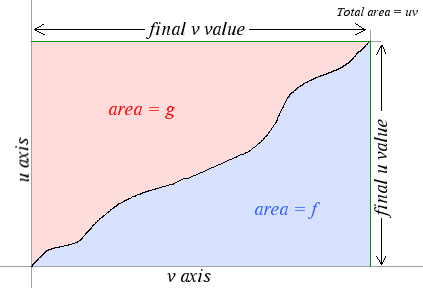 The blue area "under" the curve is the integral of u as a function of v, which we've called f. The pink area to the left of the curve, which we've labeled g, is the integral of v as a function of u.
which is just the total energy. In that case it's also easy to verify equations (h.7) directly. As with the Lagrangian formulation, however, much of the value of the Hamiltonian formulation lies in the fact that equations (h.7) are true regardless of the coordinates we're using. Also keep in mind that equation (h.8) is only necessarily true when the Lagrangian chosen is the "pure Newtonian" T-V. For other Lagrangians, the Hamiltonian won't necessarily be the total energy of the system. Page created on 11/13/06; last updated, with additions and different equation numbers, on 12/1/06. Corrected equation numbers, 10/4/07.